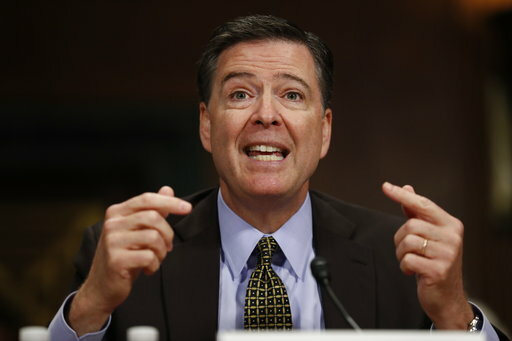 WASHINGTON (CN) – The House Oversight Committee said Wednesday that it will hold a May 24 hearing to investigate if President Donald Trump interfered in FBI probe, and that it has asked former FBI Director James Comey to testify. In the meantime, Republicans and Democrats on the Senate Judiciary Committee said Wednesday they’ve also asked ousted FBI Director James Comey to testify to Congress. “I think the legislative process is pretty much ground to a halt until you get the Comey episode dealt with,” said Republican Sen. Lindsey Graham of South Carolina, a member of the committee. Meanwhile, the White House continued to try to get its arms around the unfolding scandal. Speaking to reporters aboard Air Force 1 Wednesday after President Trump delivered the commencement address at the US Coast Guard Academy in Connecticut, White House spokesman Sean Spicer did not directly address Comey’s pending testimony before Congress, but did say “The president is confident in the events that he has maintained and he wants the truth in these investigations to get to the bottom of the situation. “There are two investigations going on in the House and Senate and he wants to get to the bottom of this,” Spicer assured the reporters on board. “The president has been very clear that the account that was published is not an accurate description of how the event occurred. I’m not going to give any other comment on that,” the White House spokesman added. By mid-day Wednesday, three congressional committees had formally requested to see memos penned by former FBI Director James Comey that reportedly detail President Donald Trump’s request that the agency drop its investigation into former National Security Adviser Michael Flynn and Russian meddling into the 2016 election. The New York Times report on Tuesday that Trump asked Comey to drop an investigation into his fired adviser’s ties to the Russian government has sent Capitol Hill spinning, with some Democrats even raising the specter of impeachment if the memos are accurate. In addition to sending a letter to acting FBI Director Andrew McCabe requesting copies of the bombshell memos, the Senate Intelligence Committee has also reissued its request that Comey come testify before the committee both in public and behind closed doors. The committee is in the middle of a lengthy investigation into Russia’s attempts to influence the 2016 presidential election, which intelligence agencies have confirmed was undertaken to help Trump beat Hillary Clinton. Comey declined the committee’s first request to appear, reportedly because he wanted to testify in public rather than in a closed session. Warner said the effort to get Comey before the committee is bipartisan and that he expects to receive an answer from McCabe within 72 hours. “I don’t think I know any member that I’ve talked to publically or privately, Democrat or Republican, that doesn’t think that Jim Comey deserves a chance to tell his side of the story,” Warner said. Shortly after the Intelligence Committee requested the memos, the Senate Judiciary Committee did the same, sending its own letters to both McCabe and White House Counsel Donald McGahn. On top of the memos detailing Comey’s conversations with Trump, the Judiciary Committee is also interested in those concerning discussions with former President Barack Obama about the Clinton email investigation. The letter to McGahn specifically asks the White House to turn over “recordings, transcripts, notes, summaries and memoranda,” that touch on either of the two investigations. Trump raised the possibility that a recording of his conversation with Comey exists when he made a threatening reference to “tapes” of the discussion on Twitter. The House Oversight Committee kicked off the run of requests last night by sending a letter to McCabe asking for Comey’s memos. Rep. Jason Chaffetz, who leads the committee, said he has taken the steps to set up a hearing with Comey next Wednesday, but that he “still needs to speak” with him about testifying. None of the committees have subpoenaed the records, and Senate Intelligence Committee Chair Sen. Richard Burr told reporters Wednesday he did not expect to have to for Comey to appear. Chaffetz said on Twitter on Tuesday that he has his “subpoena pen ready,” Warner noted issuing a subpoena is a move of last resort. “You start the process with a request, you don’t use the other tools until you need to,” Warner told reporters. The requests, which could not happen without the support of the Republicans who lead the committees that issued them, show the increasing pressure on Trump that is starting to come even from within his own party on Capitol Hill. Rep. Justin Amash, R-Mich., made waves on Wednesday when he told The Hill that Trump could face impeachment if the details in the memos were born out. But the most pressure on Trump is still coming from the left, with Democrats in the House on Wednesday renewing efforts to force a vote to establish an independent commission that would look into Russian attempts to influence the 2016 presidential election. The measure, called a discharge petition, was first introduced by Reps. Eric Swalwell and Elijah Cummings and would force a vote if 218 members sign on to it. So far only Amash and North Carolina Republican Rep. Walter Jones have crossed the aisle to sign the petition. The petition would be a slow-moving solution, as the procedural rules that govern it would mean it could not be brought up until July at the earliest. But Cummings said the move is important regardless of how long it takes to accomplish. Rep. Joe Crowley, D-N.Y., noted at the press conference that Speaker of the House Paul Ryan could speed up the process of establishing an independent commission, but such a move seems unlikely, as earlier in the day Ryan recommitted to his position that the ongoing congressional investigations into Trump’s Russia connections are sufficient without an independent prosecutor or commission.